I’m still around and running. With summer almost ending I’m trying to spend it doing all the things you just can’t do when you are busy teaching and coaching. That sort of means less blogging to make more time for those important things. Back to the clean eats though-the point of this post. 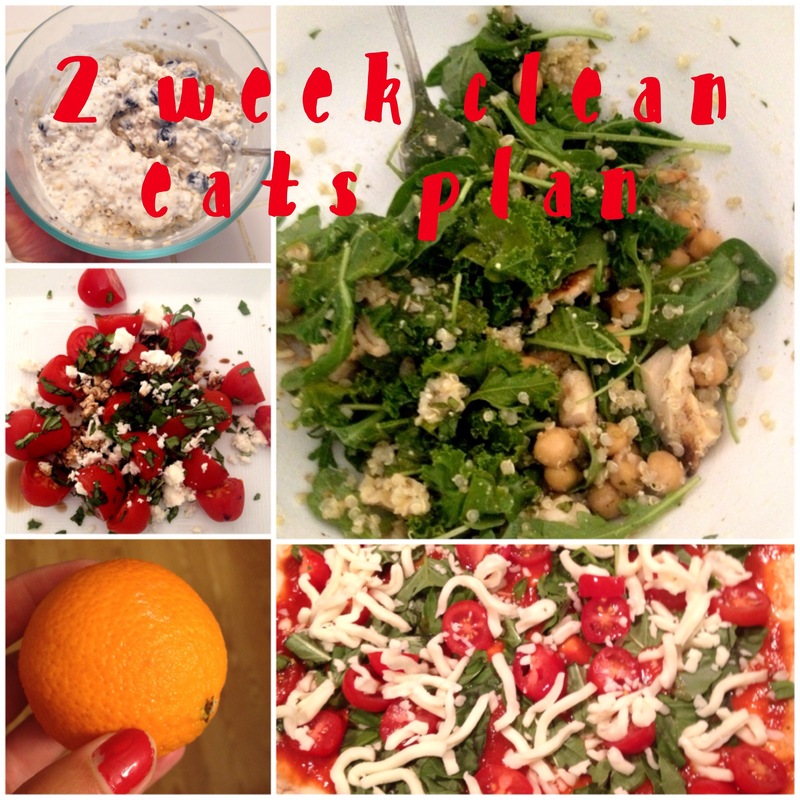 Over the past two weeks I followed Buzzfeed’s Clean Eating Plan as carefully as I wanted. This means on some days I ate nothing but what the plan described. Other days there were grill outs with friends and rather than being the weird friend refusing to eat what everyone brought, I enjoyed a break from the plan and savored every bite. Rather than blab on and on about what I ate each meal, I will share some photos and describe what I felt the pros and cons were after the two weeks. I planned to take more photos, but once I discovered how much time clean eating takes I said forget that. Bottom right photo is pizza I had to make one night when the husband and his friend would not shut up about ordering pizza and eating their pizza in front of me. The crust was a recipe I found on pinterest. I also used greek yogurt and a recipe from the side of the Chobani container to make another version of this during the two weeks. (Tomato-Basil-Ricotta Pizza). 1) I was eating healthier. It felt good to eat lots of fruits and vegetables. I felt full without that tired, sort-of-gross full feeling. After eating a meal I felt like getting sh*t done instead of taking a nap. 2) Making healthy choices became easier. When I fed my body good foods, it wanted good foods later. Now I find myself choosing healthier options more often than not. 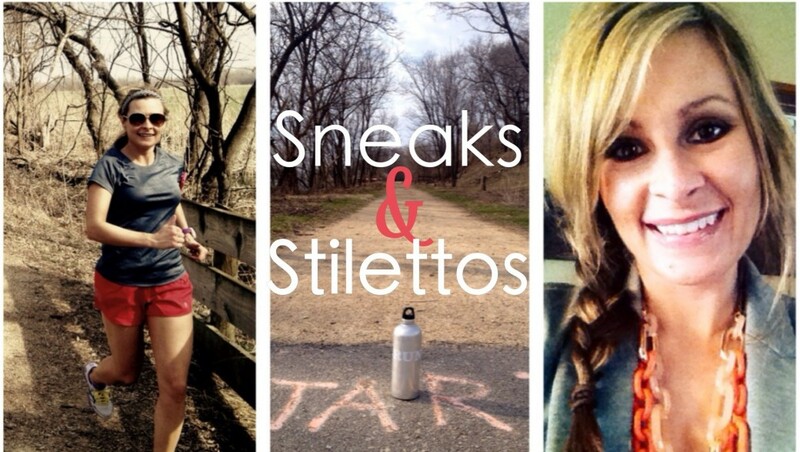 3) While eating clean my desire to run came back. Can I attribute this need-to-run, want-to-run feeling to eating clean alone? Perhaps not, but I do feel exercise and eating clean fuel each other. I’m just relieved to have that I want to run/can’t wait to go for a run feeling back. For the past month before I dreaded most of my runs other than my races. I also felt better on my runs. 4) For the first time in a decade I don’t crave diet soda anymore. Diet Mt. Dew was my vice. We never were without it in the house. I packed it in my overnight bags, extras in the car, kept a case at work, and brought it to family events. I started my day with a can each morning-even before a race. I then enjoyed a can at lunch and with dinner. On rough, tired days throw in another can. To be fair I had been cutting down my Diet Dew intake earlier this spring and began replacing it with a healthier option-sparkling water (La Croix specifically), but it was hard! Then the end of the school year came and I fell off the wagon. Big time. While on vacation I limited my Diet Dew to one or two cans on most days. Hiking for 4-10 hours on many days helped. I had a few cans the week before my clean eating plan because that was all that was left in the refrigerator, but I still wanted soda everyday. Now, we haven’t bought Diet Dew in three weeks and I don’t even care. A few months ago no Diet Mt. Dew in the house would signal a tragic reaction from me. Not any more. Also, it has been nearly three weeks since we’ve eaten fast food and I haven’t wanted it once. We usually only eat fast food when on the road, but once in a while after a crazy day we go through the drive thru. Not once since I cleaned up my diet because I haven’t wanted to. Connection? I think so. 5) Following the plan got me to try new foods or old foods in new ways. And, I actually liked almost all the meals. I had put kale on pizzas before, but not in salads, sautéed or in smoothies. I found it really was good after adjusting to the texture a bit. I ate chickpeas, unsalted almonds, unsweetened almond milk in smoothies, roasted cauliflower, cucumbers, fresh mint and parsley on salads (I previously said I didn’t like cucumbers and often didn’t use fresh herbs-so much tastier), veggie chili with paprika seasoned greek yogurt instead of sour cream (although, I must admit I hate sour cream and never eat it on top of anything), almond butter on fruit, chia seeds in smoothies and yogurt parfaits, eggs on salads, peeled zucchini and asparagus in place of pasta, and homemade vinaigrettes that tasted so yummy you’d swear you bought it. So I said I wouldn’t blab on about this, but you guys-I actually liked it all! If your someone who has shied away from some of these recipes and meals because you think you won’t like it, I know how you feel because that was me! I ate safe to me healthy foods in the past and have grown to like most veggies, but this really opened my eyes. At least try a few; I’m confident you’ll surprise yourself. 1) Eating clean takes a lot of time. Seriously, a lot. Even if you prep in advance every meal requires washing, cutting, dicing, peeling, mixing, measuring, and often cooking, etc. Don’t use this as an excuse though. Sub a meal or two out for clean eating and it is doable. Plus, the pros and the investment in your health are worth the time. 2) I still craved processed food/carbs. I was surprised by how much I still wanted processed foods and carbs (pasta, bread, etc.) even after following the plan exactly. A friend of mine who has followed clean eating plans for months has said it can take up to six weeks for this to go away. 3) I was still hungry. Not all the time, but some days it wasn’t enough. On those days I tried to eat low-glycemic foods like nuts or fruit to snack on in addition to the plan. I also didn’t drink enough water some days so that could have been part of it. Some days it took me too long to realize I was hungry and I became hangry. The husband loves when this happens. Some days a runner girl just needs more to eat, too. 4) No alcohol or caffeine. Did I do this? Hell to the no! I drank that huge margarita with my Mexican food. How could you not? I did cut back on alcohol a lot though and, as you already read, cut out soda. I had one cup of coffee each morning. Sometimes it was even decaf! So I did what I knew would work for me. Putting a big fat no on something for me only means I will have double of it! 4) Eating clean is expensive…when you buy mostly organic. You wouldn’t have to, but I prefer this option. I picked and chose what to buy organic to try to keep costs down, but I still had one expensive grocery bill. It looks like we will still be able to pay the mortgage, but ouch! I should mention though that buying from Buzzfeed’s week 1 and week 2 lists did last me more than the one week they said it would. I only had to throw away one container of spinach. Not so bad. So great, I followed this plan. Now what? This plan did exactly what I’d hoped it would. It got me back on track and eating more fresh and unprocessed foods. What has stuck with me? 1) No more soda in our house. Something I thought that would never be possible for me is. 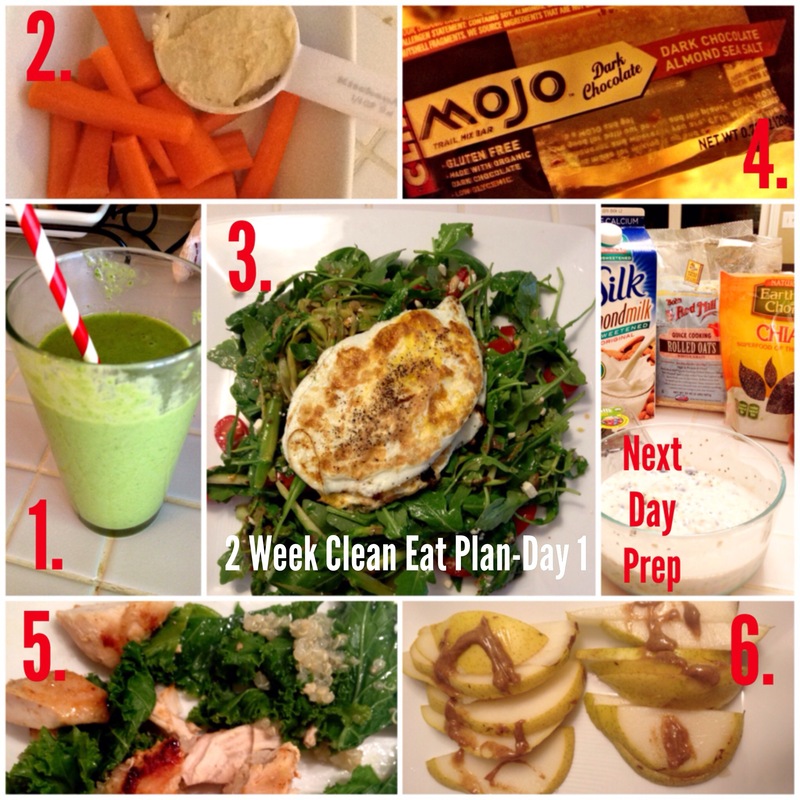 2) Eating clean meals at least once or twice out of the three meals in a day. Eating clean snacks at least once per day. I’ve found myself doing this naturally. Instead of my typical english muffin for breakfast pre-clean eat plan I’ve stuck with the breakfasts I ate on the plan-smoothies, parfaits, eggs, and overnight oats. More protein at breakfast keeps me full longer. I am reaching for fruits and veggies to snack on instead of processed crackers or granola bars. 3) I randomly add more veggies to most foods without thinking about it. I made crockpot lasagna the other night and knowingly subbed turkey in place of beef and then automatically put in only half the noodles, added double diced tomatoes, and threw in some extra veggies to make it healthier like fresh garlic, onions, zucchini, and fresh basil. I see small changes like this lasting for good. 4) I feel the running and eating connection more. This keeps the healthy circle flowing. Hopefully this encourages some of you to try eating clean more often. I knew I couldn’t try a meal or two and make lasting changes. I needed a longer two-week plan to make lasting change. Do what you know works for you and your family. I’m so proud of myself and the changes I’ve made. I’ve been wanting/trying to do this for so long and I feel like I’ve finally reached a point where it is a lifestyle change. Will I still drink beer and eat pizza. Of course…but now I will do so with much more balance in my diet. Go for it, guys. You’ve got nothing to lose. Your photos are gorgeous! All that food looks amazing. You have to share the smoothie recipes. I’m forever on the hunt for a green smoothie recipe that does not taste like a liquid salad. I’m one week into the 21 Day Fix challenge. It’s a half hour intense workout each day and a meal plan. You’re right, it does require a lot more time. I’ve washed sooooo many dishes in the past week. And chopped a lot. But I agree that I feel more full and ENERGIZED, not full and sloth-like. But it’s a conscious decision each day to figure out meals so I get the right portions of each food group. I see the flaws in my old ways where I was quick to load up on carbs and dairy and now I have to make sure I’m getting enough protein and vegetables instead. I really appreciate the mindfulness this challenge has brought me though. I’ve never tried anything like this before and I’m learning lots. Good luck to you! Sounds like you’ve figured out a nice balance. Thanks! I think I’ve found some balance between the endless chopping and still having life. It’s nice to hear others have had similar experiences with clean eating. The smoothie recipe is: 3 cups of kale (centers removed), 1 banana, 1 cup unsweetened almond milk, 1 tbsp of almond butter and 1/4 tsp. of vanilla. It was fairly “green” tasting so I’ve since added some more fruit like mangos or strawberries to take the edge off. 🙂 I’ll have to check out the 21 Day Fix challenge. Good luck on the rest of your challenge. You got this! Great post! I am trying very hard to incorporate clean eating into my diet. It helps that my husband likes to clean eat as well. I’m not trying to let the excuse “that it is summer” get in my way!! Great job with balance!!! Glad your love for running is back! It is so easy to fall victim to excuses. First it’s summer, then it is Halloween candy, then Thanksgiving feasts and Christmas goodie traditions and on and on. Sometimes I just have to remind myself that there can always be excuses, but it doesn’t make it easier. I still have bad days and pitfalls, but being mindful of how easy excuses can be, I seem to do better! Any great clean recipes you’d recommend?